April 21, 2014, 10:58 a.m.
— Print advertising revenue continues its massive slide, down another 8.6 percent in 2013 — another $1.6 billion gone missing. An annual decline in the high single digits has become the norm; you don’t hear people talking about getting back to par, as you did three or four years ago. NAA’s release notes that print advertising now “makes up less than half of total revenue,” which is true. But that’s not because of the strength of everything else; it’s because print advertising is in a state of collapse that isn’t going to stop anytime soon. — Those two numbers combined mean that, in 2014, American newspapers still get 83 percent of their advertising revenue from print. I feel confident in saying that newspaper print advertising will decline again in 2014, most likely in the high single digits again. Digital advertising will continue to muddle along with a slight increase. 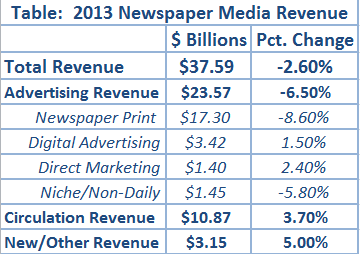 The key question for 2014 is whether circulation revenue gains can continue. It’s the only thing providing meaningful resistance to that ad decline. Industry-wide, there’s probably some growth left, if only from more papers adding paywalls. Most American dailies still don’t have them (roughly 900 out of 1,400), despite the boom of the past two or three years. Many of those are small or weak enough that a paywall might be a hard sell, but there are still some candidates out there, and one could expect a boost in circ revenues just from them. But for individual newspapers with existing paywalls, it’s a very real question. Are the John Patons right that digital subscription revenue is a one-time gain, destined to plateau or even fall off? If that’s true — and I think for many newspapers it is — you could easily see a bigger overall revenue decline in 2014 than in 2013. Benton, Joshua. "American newspaper revenue is still dropping, just not quite as much as before." Nieman Journalism Lab. Nieman Foundation for Journalism at Harvard, 21 Apr. 2014. Web. 18 Apr. 2019. Benton, Joshua. "American newspaper revenue is still dropping, just not quite as much as before." Nieman Journalism Lab. Last modified April 21, 2014. Accessed April 18, 2019. https://www.niemanlab.org/2014/04/american-newspaper-revenue-is-still-dropping-just-not-quite-as-much-as-before/.